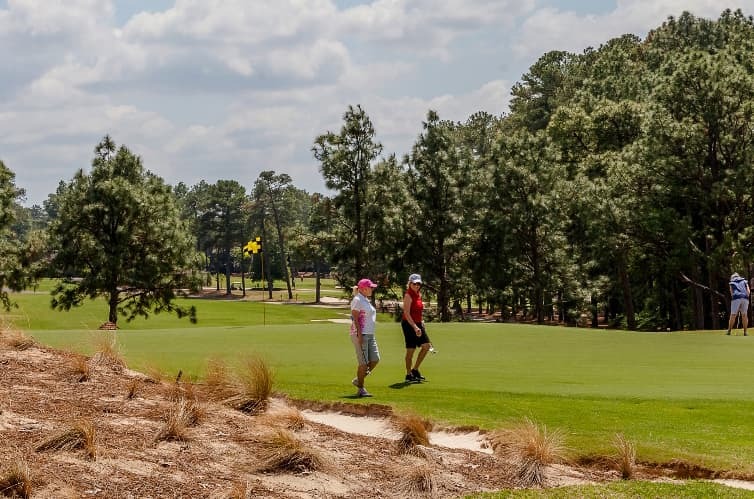 VILLAGE OF PINEHURST – Playing her third Women’s North & South Amateur, Malia Nam probably has more experience on Pinehurst No. 2 than the player she grew up idolizing – Michelle Wie. Nam, of Kailua, Hawaii, carded the lone round under par on a difficult day on No. 2, making three birdies to go with one bogey for a 2-under-par 69 to lead by two shots after the first round of the 116th Women’s North & South Amateur on Monday. Nam reached the semifinals of the North & South in 2016 and qualified for match play again last year. But her performance on Monday might have been her best round at Pinehurst. Though playing to a par 71, No. 2 played almost as long – at 6,448 yards – as it did when Wie won the 2014 U.S. Women’s Open. A consistent breeze didn’t help scoring as the field’s scoring average ballooned to 80.1. Of the 90 players in the field, only three of them managed to shoot par or better – DeeDee Russell, of Rabina, Australia, and Ivy Shepherd, of Peachtree City, Georgia, who managed even par 71s. Russell was 2 over until she reached her approach shot on the 18th hole. With a sizable gallery looking on from the veranda, Russell sunk a gap wedge from 103 yards for an eagle 2. Ivy Shepherd, who will join Clemson in the fall, shook off two bogeys in her first four holes to rally with a birdie on 8 and birdies on 14 and 16 to share second with Russell at even. The Women’s North & South Amateur continues to draw some of the top amateur players in the women’s game. A few of the notable players in the field enjoyed solid, if not perfect, rounds on a difficult day for scoring. Defending champion Isabella Fierro did not make a birdie in the first round on Monday, but kept mistakes to a minimum, finishing the day with a 5-over 76. That’s good enough for a tie for 13th. Anna Redding, the 2013 North & South Girls’ Junior Champion and Women’s Runner-Up a year ago, suffered two triple bogeys but countered with three birdies to hold her round together, finishing with a 6-over 77 that left her tied for 20th. This is her fifth Women’s North & South. Jaclyn Lee, of Calgary, led the NCAA Championship late in the final round this year before finishing fifth. A veteran of the Women’s North & South, Lee carded a 4-over 75 and is tied for 9th. Jennifer Chang, of Cary, North Carolina, is one of the top prep recruits of recent years. A four-time state champion and two-time prep All-American, Chang enrolled early at Southern Cal and made the All-Pac-12 First Team this season. After a 5-over 76, Chang is also tied for 13th. Kelly Whaley, the top player at UNC-Chapel Hill and the daughter of PGA Vice President Suzy Whaley, shot a 2-over 73 and is tied for fourth. Medal play will continue with the second round on Tuesday, and the field will be cut to 32 and move to match play. The Round of 32 and Round of 16 will be played on Wednesday while the quarterfinals and semifinals will be played on Thursday. Danielle Kang won the Women’s North & South in 2011.